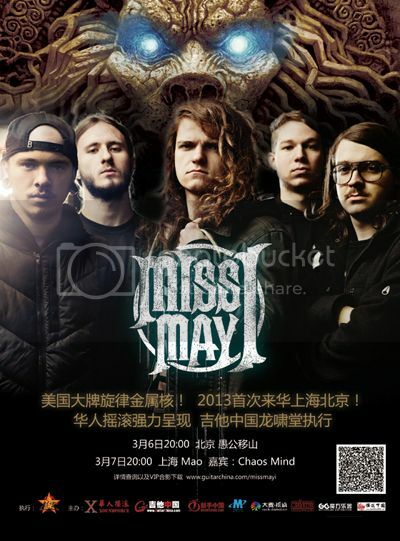 American Melodic metalcore band Miss May I announced they will be in Beijing on March! The show is on March 6th at Yugongyishan live house, it’s gonna blow your mind. Miss May I is an American metalcore band from Troy, Ohio. Formed in 2006, they signed to Rise Records in 2008 and released their debut album, Apologies Are for the Weak through the label while the members were still attending high school. The album reached No. 29 on Billboard’s Top Heatseekers, and No. 66 on Top Independent Albums. The band has also had some of their material featured in big named productions, such as how “Forgive and Forget” is featured on the Saw VI Original Motion Picture Soundtrack and their song “Apologies Are for the Weak” is included in the video game Saints Row: The Third. The band has retained the same lineup since its formation, with the only exception being bassist Ryan Neff’s leaving in 2007 who later returned to the band in 2009. 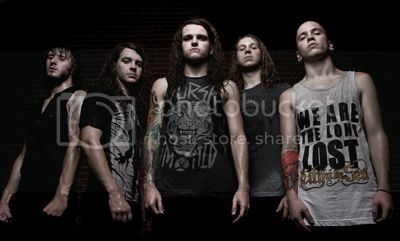 Miss May I released their second studio album, Monument, on August 16, 2010 and their third album, At Heart on June 12th 2012.